1. Cook smoked bacon according to package directions. Transfer bacon to paper towels to drain. Meanwhile, in large skillet, in 2 batches, heat Canadian bacon over medium heat 3 to 4 minutes or until browned, turning once halfway through cooking. 2. In small bowl, mash avocado with fork until slightly chunky; stir in mayonnaise and cayenne pepper until well combined. 3. To serve, split rolls and toast. Evenly spread Avocado-Mayo over bottom halves of rolls. 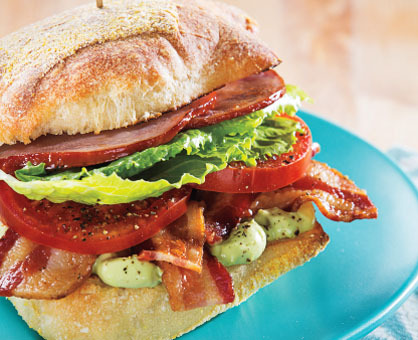 Over Avocado-Mayo, evenly layer smoked bacon and tomatoes; sprinkle tomatoes with salt and pepper. Over tomatoes, evenly layer lettuce and Canadian bacon; close sandwiches.